and he had to appease the hostile population and provide it with work. and Hippicus, after his closest friend and supporter. See reconstruction of these towers below. 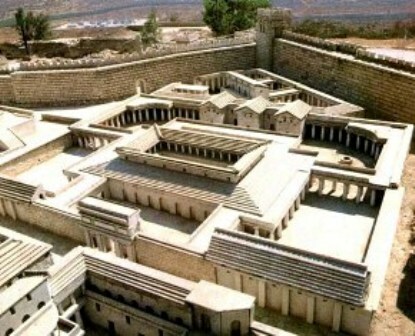 He also built a theater in the part of the city inhabited by wealthy Hellenizers, raised an inner wall to protect the Upper City, and strengthened the North Gate in the Second Wall. South of the Temple Mount he built a stadium, probably in the Tyropoean valley. 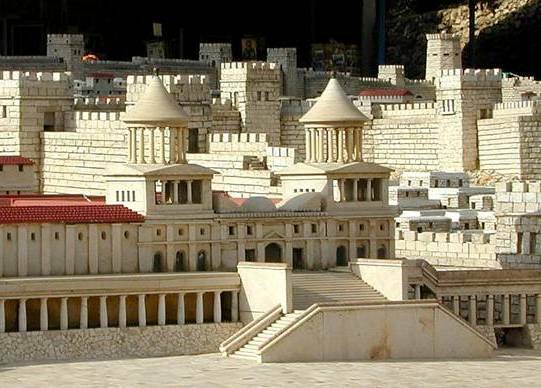 Herod was even more active on the Temple Mount: doubling the area of the Temple esplanade and girdling it with walls and porticoes. 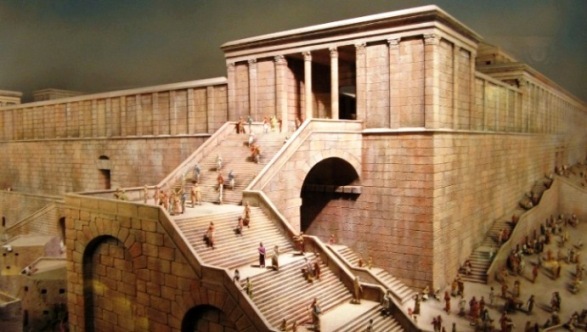 lts most prominent feature was the ‘royal portico’ (basilica) in the south of the square, which Herod connected with the Upper City by a second bridge, known after its discoverer as ‘Robinson’s arch’ (see reconstruction below). At right is a coin dating from this period; it is the only known contemporary image of the Temple as reconstructed by Herod the Great. 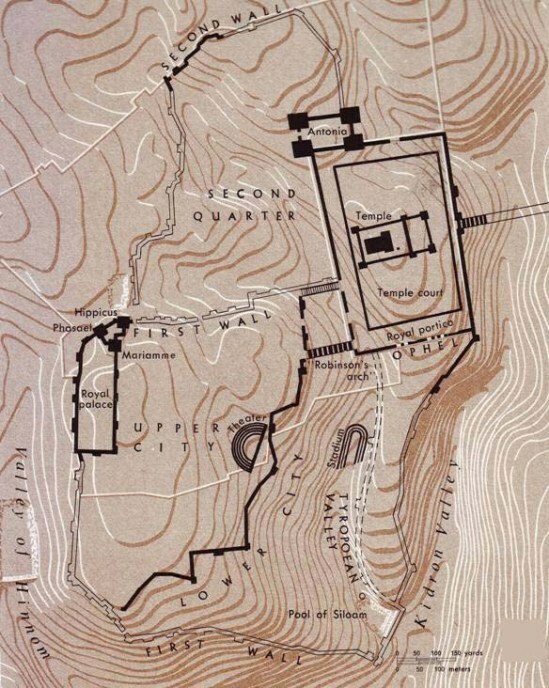 The king also rebuilt the Temple proper and to secure control over theTemple rebuilt the old Baris, at the northwestern corner of the Temple Mount, into a huge fortress, which he called ‘Antonia’ in honor of his Roman patron and friend, Mark Antony. 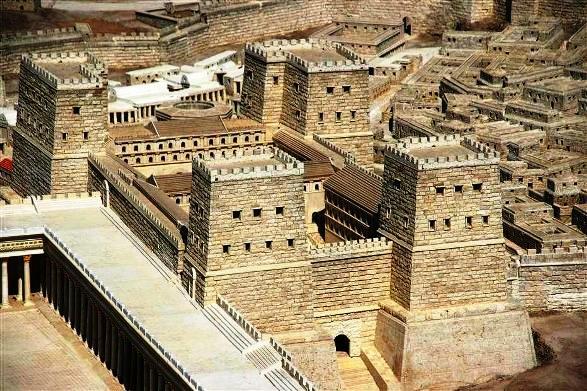 Herod was also active as a builder outside his capital: he founded the harbor city of Caesarea in place of Strato’s Tower and rebuilt Samaria, calling the new city ‘Sebaste’ in honor of the Roman emperor Augustus. He built fortresses at Herodium and near Jericho, and entirely reconstructed Macherus (where John the Baptist was beheaded) and Masada on the two opposing shores of the Dead Sea. The fortress towers built adjacent to the royal palace. See middle left of map at the top of this page.